Do you ever wonder if you have big gaps in your Google Ads campaigns that are costing you money? That’s because Google Ads (previously called Adwords) is the most complicated (and sophisticated) advertising platform in the world. There are lots of hidden settings and buried features that are wasting your money and keeping you from having the most profitable campaigns. …Which is why so many people struggle to make paid traffic profitable! Wouldn’t it be nice to know the most common mistakes so you could drastically increase your ROI? In today’s article, I’m going to be breaking down the TOP mistakes we see every day – and how to fix them! It takes a lot of effort to get the campaigns set up – from keyword research to ad copy, to landing pages, tracking, and more. It’s easy to think the job is done after your campaign is up and running, but that’s just the beginning! You need a multi-stage optimization process. In fact, there are an unlimited number of optimizations you can do for your campaigns! Daily checkups are necessary to see if anything strange is going on – you ARE spending money daily after all. These can be done on a daily or weekly basis as you get more data. Each month you can take a larger look at what’s performing and what’s not and make decisions on your strategy. The more budget you’re working with the quicker this can be done. You don’t want to optimize campaigns too early before you have enough data, but you don’t want to let non-performers keep spending. By using a multi-faceted approach, you can continuously optimize your campaigns after launch. Keywords are words or groups of words that you can target within Google Ads. But when most people go to search, most of the time they do NOT type in just the keyword that you’re bidding on. Instead, most searches are “long tail” – meaning they are all types of variations that may include the keyword that you’re bidding on. For example, you might bid on “Blue Widgets” for your business. That would be a great keyword to bid on since you sell blue widgets, right? Both these searches contain your keyword, but the user is clearly not looking to buy blue widgets! Before setting up campaigns, you can do research for irrelevant keywords and add them to a negative keyword list before you even launch. These keywords will tell Google which searches you don’t want to show up for, so you won’t waste money on irrelevant search terms! 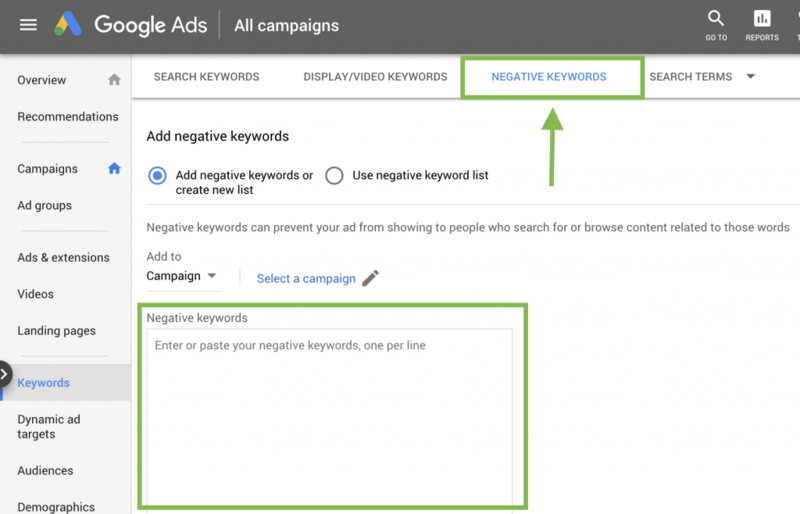 Your negative keyword list can also help improve ad group relevancy and save you money from unwanted clicks. You can use a tool like answer the public to find variations to add as negative keywords before your campaigns even launch! We call this “pre-optimization” and it’s a crucial step! This should save you a bunch of money before you even start your campaigns. So now you know that people mostly search with long-tail phrases and that many searches may be irrelevant. How do you know what actual search terms are costing you money? Behold, the search term report! 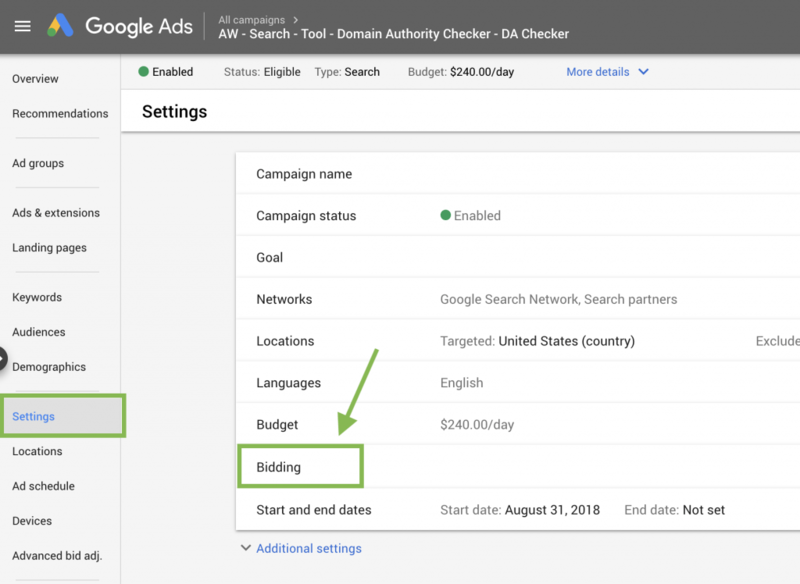 Once you’re inside your Google Ads account, just go to Campaigns → Keywords → Search Terms. These are called Search Terms (or Search Queries) because these are the actual things people are searching for that are triggering your ad to be displayed. This hidden report shows all the things people are searching that you’re paying for when they click your ads. You might find a ton of great keywords you can siphon off into their own very specific ad groups, or you might find keywords you want to ELIMINATE because they are costing you money! That’s awesome because we aim to build the best place in the world to work, but that’s not the intent of the ad. Instead, we’re running this ad to get customers, and these searches are very unlikely to lead to a purchase, so we will exclude them! Your report will also give you insight on ways to better understand your audience, cater your ad copy, landing pages, and keywords to serve them the best. There’s a good chance that you set up your campaign with an automated bidding strategy. Why? Well because that is Google’s default settings and Google is an advertising platform. That is how they make their money. But the problem is this lets Google bid whatever it wants for the keywords you’re targeting… and it will! To check to see if your campaign is automated vs. manual follow these easy steps. This mistake alone could save you hundreds if not thousands of dollars in the long run. Plus it only takes about 5-10 minutes to make this change inside your campaign. When you use too many keywords per ad group, your ads can’t be specific enough to get a good click-through rate. For instance, let’s go back to the blue widget example. Instead, you would want to break these up into different groups and create new ad copy for each. By doing this, you can match the searcher intent to the right ad, then get them to the right landing page. What is the experience after someone clicks one of your ads? This results in a very low conversion rate… and high costs! A laser-focused landing page eliminates distractions and can drastically increase conversions! Building a landing page is not a difficult task anymore and you don’t even need to know how to code or be a tech wizard. Landing pages shouldn’t be fancy. Keep it simple, and get much higher conversions! If you don’t have consistency between your keywords, ads, and landing pages, people will not click on your ads, or will immediately bounce from your landing page. Most advertisers miss this mark and it cost them more than they make. Does the keyword intent match what I’m selling? Are my keywords included in my ad copy? Do I use similar verbiage and the same keywords that I use in the Ad Copy inside of my Landing Page? If you said NO to any of these I highly recommend going in and switching this ASAP. This exercise will help reduce CPC (Cost Per Click), increase the relevance, and increase CTR (Click Through Rates)! You would be surprised how this could turn your campaign around from failing to being a very profitable campaign. These are just a few of the most common mistakes that we see when running Google Ads campaigns. By fixing these, you can often turn money-losers into winning campaigns, but only when you have a well-defined, multi-faceted strategy.